Brick oven pizza is THE BEST!!!! I would LOVE to build my own brick oven out in my back yard to bake amazing artisan breads and brick oven pizza! But, since our kids need braces , I’ll wait patiently until everyone has straight teeth and then maybe we’ll build it! Until then, we use pizza stones and crank out Artisan Pizza a least once a month! 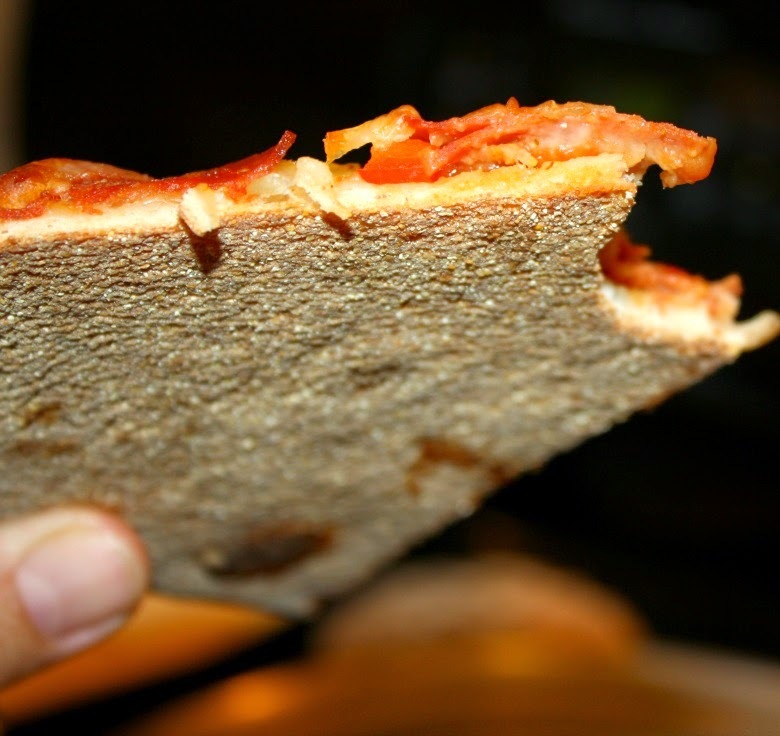 Just be warned….this could turn your kids into PIZZA SNOBS who critique all other pizzas! This Artisan Pizza has the BEST crust! Our uncle Max taught us a few secrets! The crust is super crispy on the bottom, yet chewing in the middle! 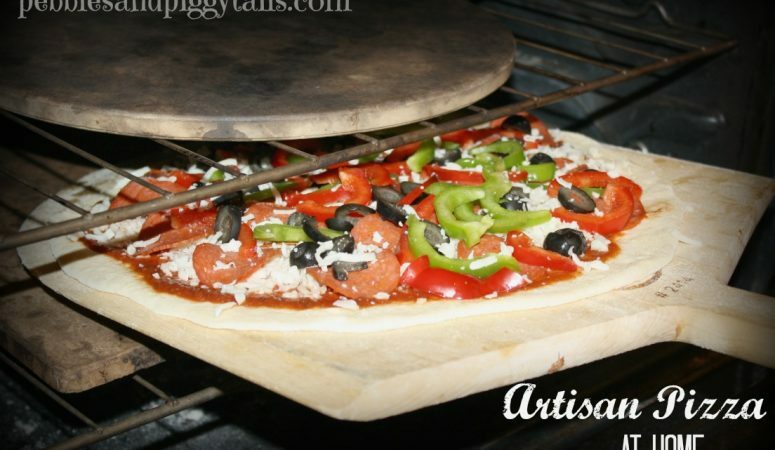 Sliding the pizza onto a FIREY HOT pizza stone makes ALL THE DIFFERENCE! Listen up and we’ll show you how! FIRST! Put your pizza stone(s) in your cold oven, then turn your oven on to 550 degrees. This gets your stone(s) all piping hot and ready to use by the time your crust and toppings are prepared! 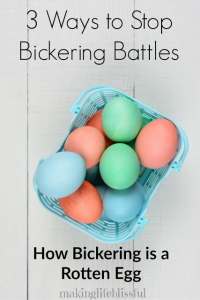 (yes…this happened at our house)……WHATEVER it is….it will happen while proofing your regular yeast and when you come back to check it….you will find a brownish bubbly mess all over your counter! Then you have to start the yeast all over, or try to scrape up all the smelly yeasty slop and hope you have enough to make your dough rise! FORGET IT! Use INSTANT yeast and you do nothing. You toss it in a bowl with the other dry ingredients, add the warm water and stir. Really! It’s the BEST! It will change your life. Next: Stir in your SHOWER HOT water. This is important! The water should be nice and warm like your early morning December shower…..nice and warm, but not scalding. You should comfortably be able to keep your hand under the warm/hot water while it is running. This will be the perfect temperature. Don’t use a thermometer for heavens sake! Just use your hand! It will work perfect…I promise! After the water, pour in your oil and honey and stir to evenly incorporate. 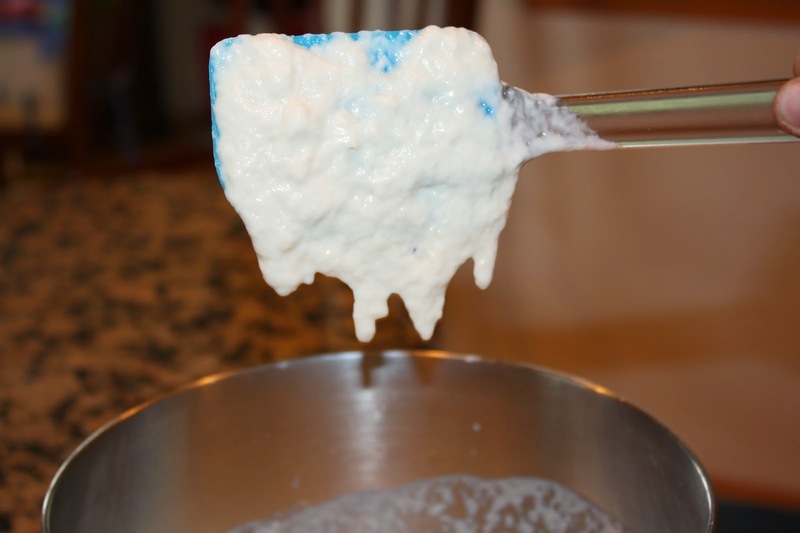 The mixture will be very loose and goopy. Like the picture above. This allows the yeast to dissolve and the gluten to get evenly distributed. 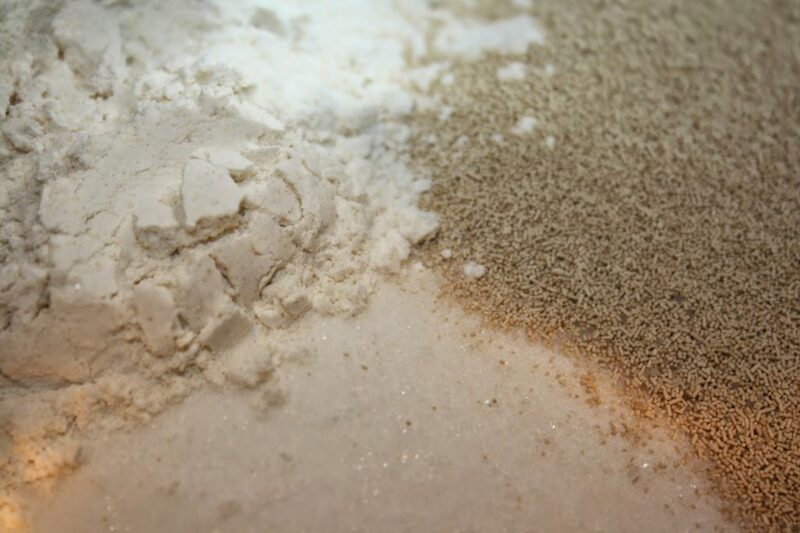 Add your flour until the dough pulls away from the sides of your mixer. You may use all 6 cups, or not, or maybe a pinch more. It depends on so many factors. Don’t worry about using an exact amount. Just wait for the dough to pull away from the sides leaving a clean bowl. The dough won’t be too sticky. You should be able to touch it without the dough sticking to your finger. 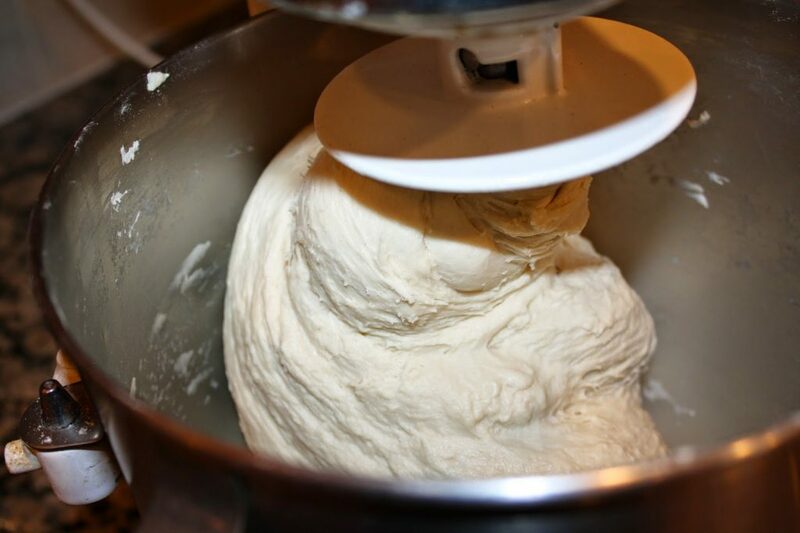 Let dough mix in mixer or knead by hand for 10 minutes. 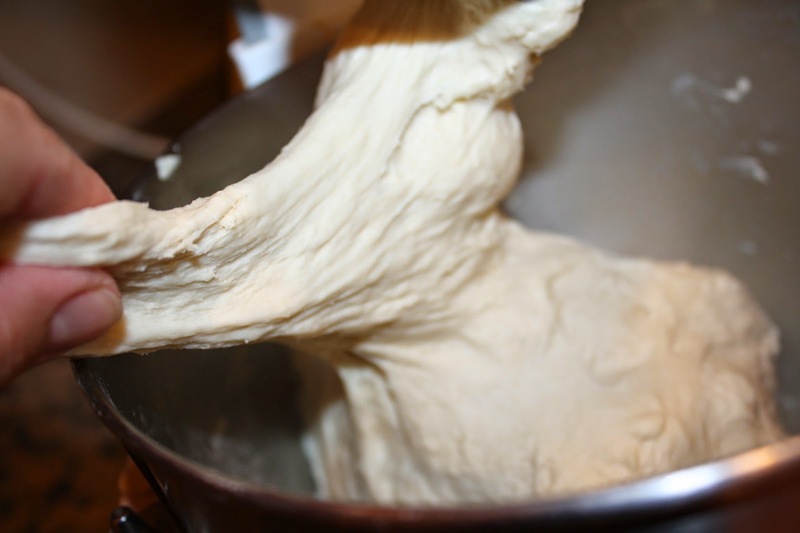 This will activate the gluten and make your dough all stretchy and amazing! The extra added gluten is what makes your crust all crunchy and chewy and incredible! 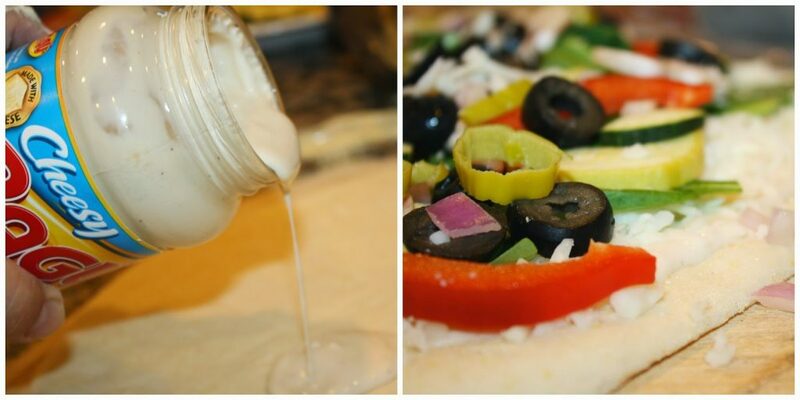 While the dough is mixing, gather and cut up all your FAVE toppings! We make combo, Greek, pepperoni, roasted chicken alfredo veggie (I LOVE this), plain boring cheese, whatever. Get what you like and go for it! Mixing is all done! See how stretchy and soft this looks! The texture is unbelievable! 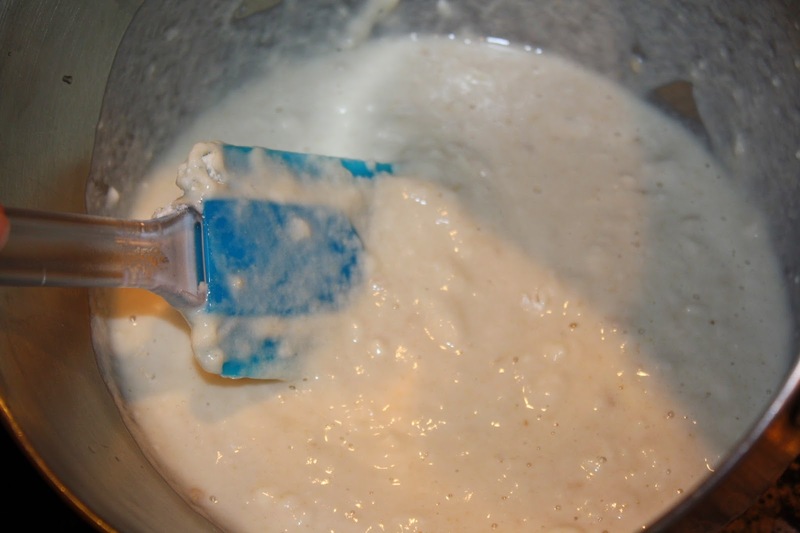 Place dough in an oiled mixing bowl. Turn dough to coat with oil. This keeps it from drying out. Cover with plastic and let dough rest 20 minutes while you finish pizza prep. Cover your counter with a hardy handful of cornmeal. This is one of the most important SECRETS! Don’t roll out the crust on flour, it will make your crust tough. Roll our your crust on cornmeal. 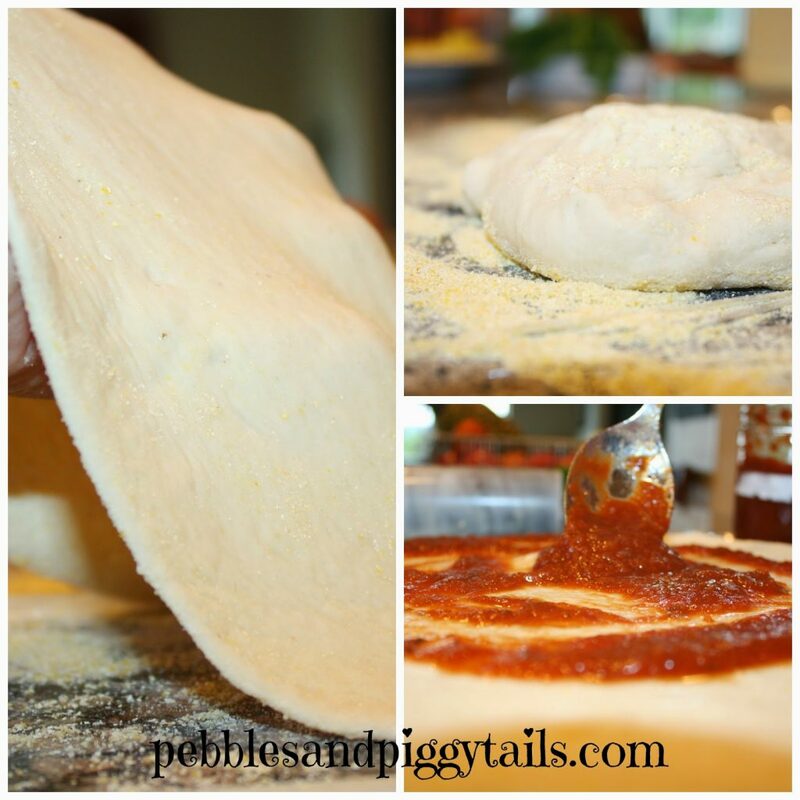 This makes the crust perfect to slide on and off of your pizza paddle and pizza stone. Roll your crust as thin as you can muster! We like our crust thin so we can eat more and the pizza cooks faster! Don’t try to make it perfectly round! Give it some character! This is artisan pizza! All the fun-wild shapes make it awesome! Lay your crust on a pizza paddle (which has been sprinkled with more cornmeal), the back of a cookie sheet, or onto a flat baking sheet with no edges. Use whatever you have in your cupboard that is flat and large with no edges. You will be using this to slide the pizza off onto the pizza stone. Before I had a pizza paddle, I used a stainless steel pizza pan for this and it worked just fine! Make sure you sprinkle it with cornmeal so it can slide freely……IMPORTANT! 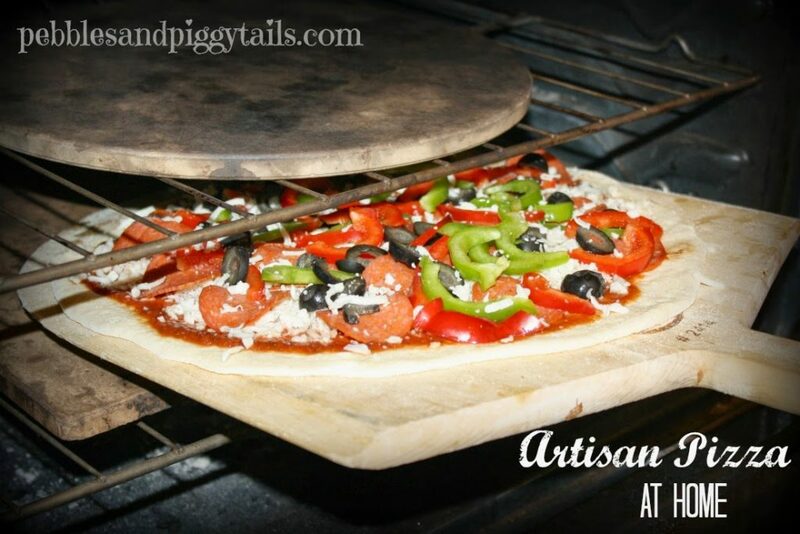 Once your pizza is topped with all your favorite things let’s slide it onto your PIPING HOT pizza stone. I use two stones because we want to crank out pizza super fast! 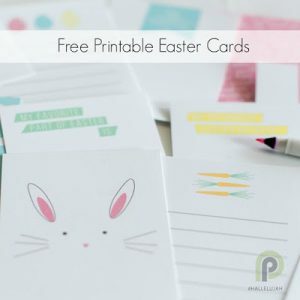 This is great for parties and family gatherings! Once we get going we can pump out a pizza every 7 minutes. If you only have one pizza stone, just put it on the LOWEST rack in your oven and you will be fine. The cornmeal on your pizza paddle will help the pizza slide freely….if not…tuck some cornmeal in the places where it gets stuck. Place the pizza paddle as far back on the pizza stone as you can reach. Slide the pizza onto the stone using short quick strokes. The pizza will slide off a little at a time until the whole thing is on the stone. Using 2 stones: Bake pizza on lower stone for 6 minutes. Pull the pizza off lower stone and slide it onto upper stone. Baking on upper stone for 1 minute gives the pizza a nice roasted and charred finish without burning the cheese. Plus, we slide a second pizza onto the bottom stone to start cooking. 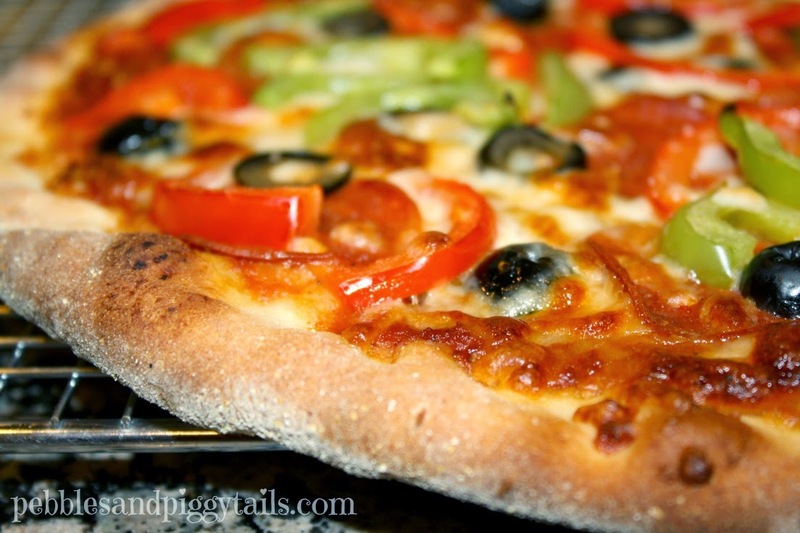 Using 1 stone placed on the LOWEST rack of the oven: Bake pizza for 7 minutes. Cool pizza on a wire rack. This keeps the crust nice and crispy. 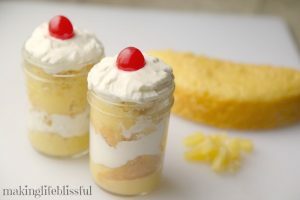 Once it’s cooled slightly, ENJOY! The best crust ever! No limp-floppy pizza here! Nice and crunchy, yet chewy! A HUGE hit is Roasted Chicken Alfredo Veggie Pizza! The unlikely secret ingredient is ROASTED GARLIC bottled alfredo sauce. It is the only reason I buy this stuff….but it is SUPER DELISH on veggie pizza! 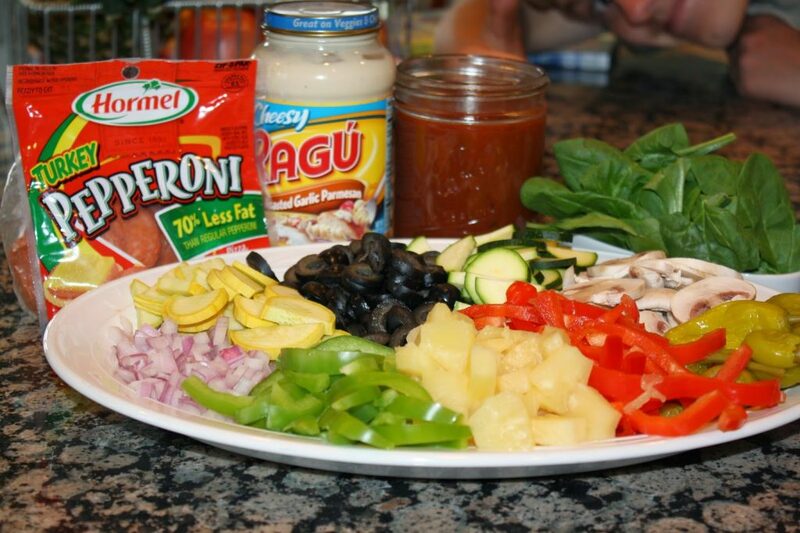 If making Roasted Chicken Alfredo Veggie Pizza ….pour sauce over the crust, sprinkle with roasted, chopped chicken, then cheese, finally top with all your favorite veggies. This keeps your chicken nice and moist and soft. If you sprinkle the chicken on top of the veggies, it will sizzle into a dried petrified piece of cardboard. Just a tip. Pile your toppings high people!!! This isn’t some lame pizza chain pizza! Put on as much as you want and you’ll be thrilled with the results! Promise! 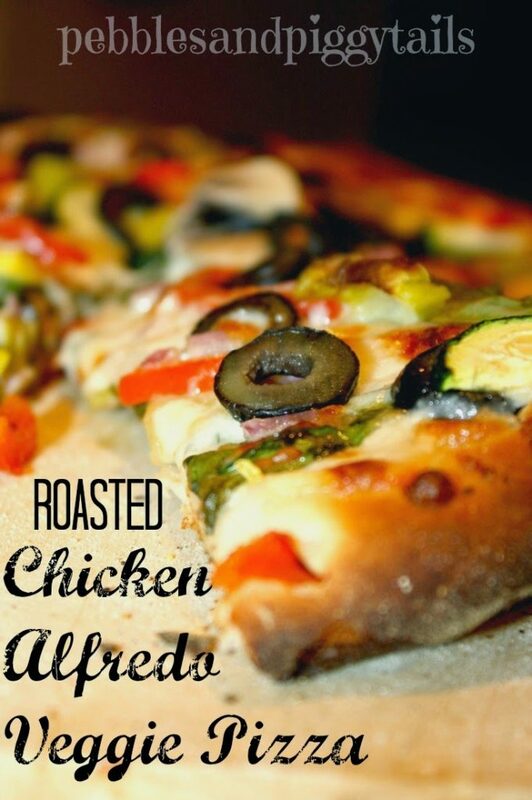 Roasted Chicken Alfredo Veggie Pizza right out of the oven…..SERIOUSLY DELISH! Seriously YUM Pizza! 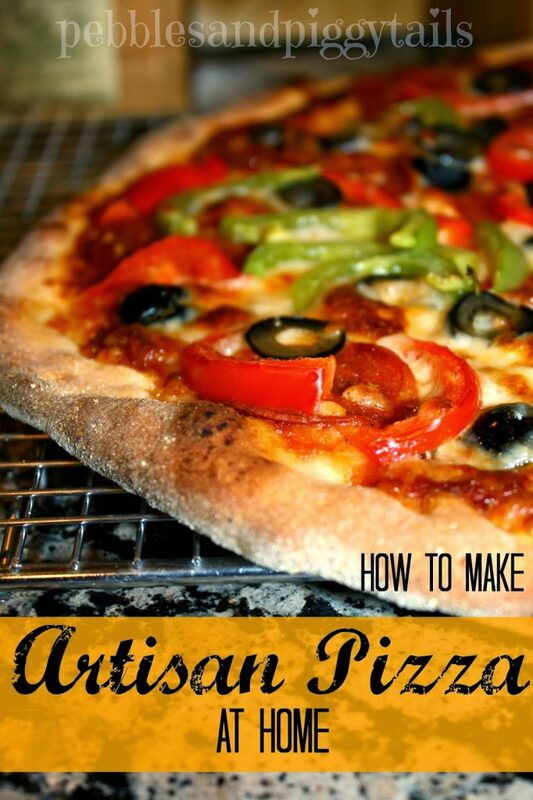 How to make perfect artisan pizza at home! pineapple, Greek olives, Feta cheese, mushrooms, zucchini…whatever you love! one on the middle rack in the oven. Divide pizza dough into 5 balls. Roll out dough on a generous amount of corn meal. Roll dough as thin as possible…like the thickness of a thick flour tortilla. Sprinkle a pizza peal or flat cookie sheet with corn meal and place pizza crust on top. The crust should slide easily on the cookie sheet/pizza peal. Add sauce and favorite toppings. 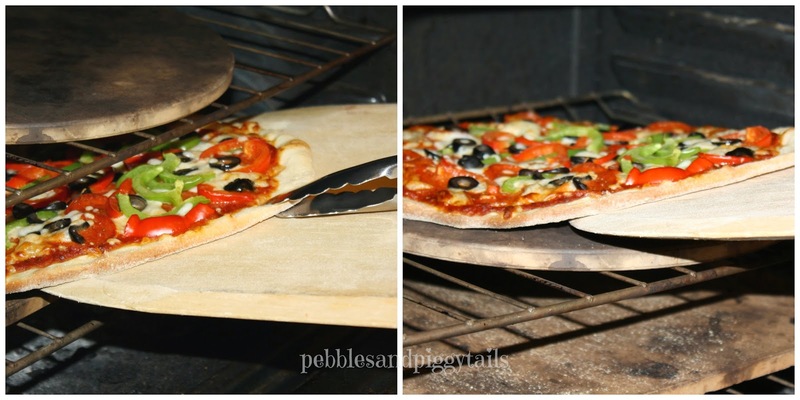 To slide prepared pizza off of cookie sheet onto HOT pizza stone…..Place the pizza paddle/cookie sheet as far back on the pizza stone as you can reach. Slide the pizza onto the stone using short quick strokes. The pizza will slide off a little at a time until the whole thing is on the stone. Bake for 7 minutes. Cool slightly on a wire rack. Voila! You have SERIOUSLY YUM PIZZA! The crust is crispy on the bottom and chewy on top!